Blessed Thomas Holford spent five fraught years working on the English Mission, in what were among the most dangerous of times, before he was finally caught after celebrating Mass at the home of St Swithin Wells in Holborn, London, and was hanged with five priests and eight lay Catholics on 28th August 1588 at nearby Clerkenwell. Blessed Thomas was born in Acton, near Nantwich, into an affluent and well-known Cheshire family, most of whom lived in the vicinity of Holford Hall, near Lower Peover, Altrincham. He was received into the Catholic faith by Richard Davis, a priest from Hereford, while serving as a resident tutor to the children of Sir James Scudamore of Holm Lacey, and on 15th August 1582 to train as a priest in Rheims. He was ordained the following April and arrived in London in the summer, narrowly escaping from a house raided by pursuivants. He was captured when he returned to Nantwich two years later, however, and imprisoned in the Castle of West Chester. Uncompromising replies under questioning by the Anglican Bishop of Chester led to him being returned to London for trial but escaped his escorts when they were wrestling with hangovers from drinking heavily the previous night. He fled the lodgings in Holborn wearing mis-matching stockings that led bystanders to think he was a madman. He crossed Gray’s Inn Fields and escaped into the countryside and walked bare-foot across gravel and through brambles to the house of his friend Richard Davis. Davis wrote later that “betwixt ten and eleven of the clock at night he came to me where I lay about eight miles from London”. The priest was almost caught a third time in 1586 when Sir Francis Walsingham raided London Catholic houses in the wake of the failed Babington plot to kill Queen Elizabeth I and replace her with Mary, Queen of Scots, narrowly making his escape from the home of Sir Richard Bellamy. Blessed Thomas, who used the alias “Acton”, stayed away from London for a while after that episode but he returned in 1588 to buy clothes. He was spotted by pursuivants after the Mass in Holborn and lured into a tailor’s shop one of them owned and was arrested there. 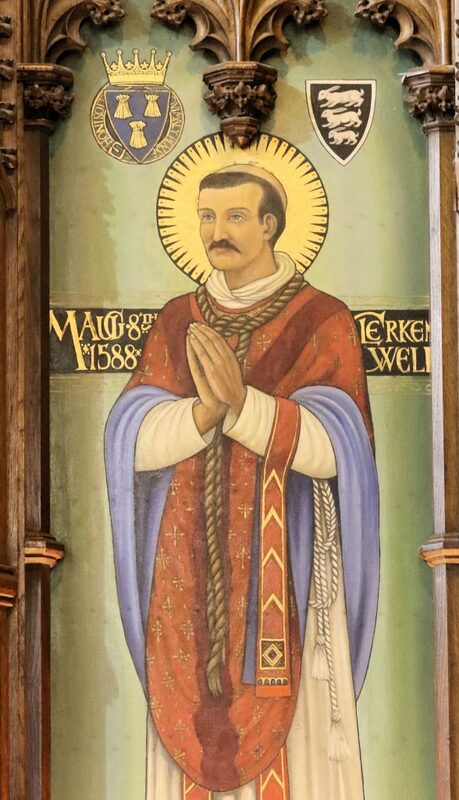 The Bishop of Chester left a description of Blessed Thomas as a “tall, black (haired), fat, strong man, the crown of his head bald, his beard marquessated (shaven except for a moustache)”. Blessed Thomas is remembered in the Catholic high school of his name in Altrincham. There is a panel picture of him in St Joseph’s Church, Sale (right).